This President’s Day weekend, let’s put politics aside and look at what we can learn from the experiences of three recent US Presidents in retirement. Barack Obama has multiple options he’s pondering for his second act. After leaving office at 55, he may perhaps have a third act as well. While he’s thinking those over let’s look at what he – and we – can learning from three of his predecessors. 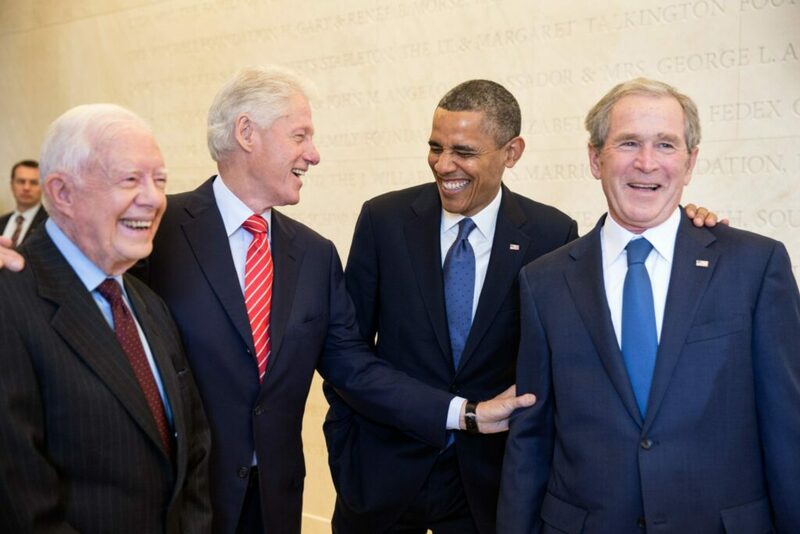 Three of the last six US Presidents left office at ages considered to be early retirement in other works of life. Bill Clinton was the youngest at 54, followed by Obama at 55 and Carter at 56. The median age of retirement in the US is 62, so George W. Bush hit the age when most Americans retire. Just like many Americans, some Presidents glide smoothly into life in retirement. But often, they face a bumpy landing that they must bounce back from. Carter and George W. Bush experienced tough conditions leaving office, each with approval ratings of 34%. And despite a very tumultuous Presidency, Bill Clinton left office with the highest approval rating since they began keeping them in 1952, at 66%. Carter began with his involvement with Habitat for Humanity and then established the Carter Center, which is credited with enhancing progress in the areas of human rights and heath globally. While clearly impactful, the second acts of both Carter and Clinton were fraught with controversy. In Carter’s case, he was sometimes viewed as interfering with diplomatic relations as a private citizen. In Clinton’s case, he pioneered leveraging the commercial potential of being an ex-President and co-mingling the philanthropic efforts of his foundation with access. Nonetheless, the takeaway here is that having a clear redefined purpose in retirement can be a driving motivational force in helping others and leaving a legacy. While you may or may not have global ambitions, think big. When we think of post-presidential second acts, Carter’s and Clinton’s come quickly to mind. However, George W. Bush’s life in retirement may perhaps be the one that more American’s can relate to. He’s stepped completely away from the fray of politics and government and crafted a diverse portfolio of interests and activities. In Bush’s case, he’s active with mountain biking, family, friendships, sports and especially painting. Early in retirement he decided to hire a teacher to learn how to paint. From there he cultivated a serious interest, beginning with painting pets, self-portraits, and then moving to portraits of other world leaders and finally US military veterans. He has a new book of 66 portraits of veterans coming out on February 28th. A study conducted by George Washington University and the National Endowment for the Arts found that immersion in activities that require or inspire creativity to be associated with a stabilization of physical and mental health, as well as enhanced social functioning. The takeaway is to consider creative and learning pursuits in retirement. Take advantage of opportunities to discover and learn something new, especially when it develops into an immersive hobby or activity that encourages the pursuit of mastery. Both Carter and Clinton have faced serious health challenges since leaving the White House. In Clinton’s case, years after undergoing bypass surgery and facing another cardiac issue, he decided to drastically change his eating habits and adopt a vegan diet. He augments the diet with an exercise program based on daily walking and balance drills. The lesson is to take control of the choices, behaviors and practices that impact health. I recently read that the baby boomer generation lacks role models in retirement. While Presidents may not make good overall role models, these three provide us with food for thought about crafting a Second Act. A three-day weekend can give you an opportunity to begin thinking about how you want to engage in an active lifestyle in retirement – one that provides you with meaningful work, engaging hobbies and social relationships. Peters, G. (2017). “Final Presidential Job Approval Ratings.” The American Presidency Project. Ed. John T. Woolley and Gerhard Peters. Santa Barbara, CA: University of California. 1999-2017. Tivens, L. (2016, September 14). George W. Bush’s paintings are no laughing matter. Attn.com. Retrieved from http://www.attn.com.